One of my secret favorite recipes on Macheesmo is this delicious eggplant orzo bake I like to make in the winter. It’s sort of like a lazy man’s eggplant parmesan. 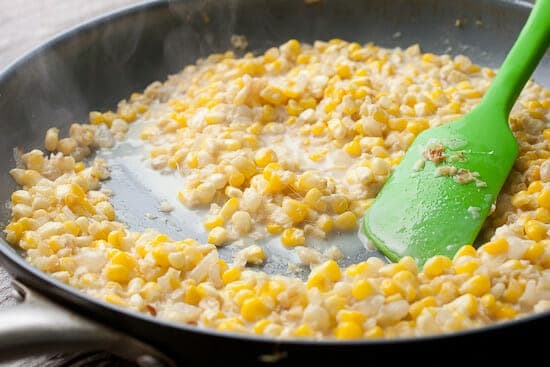 I was craving a similar sort of thing recently but wanted to summerize it a bit with fresh sweet corn (creamed together with garlic and onions). Originally, I wanted to toss some Hatch chiles in as well, but they aren’t quite available yet in Colorado. Instead I used a mix of easy-to-find chiles that I just roasted for a few minutes. Bake the whole situation together and you end up with a perfect summer pasta bake that’s somehow light and filling at the same time. It’s a good way to show off seasonal fresh corn in a dish that can be served as a dinner or as a side dish! 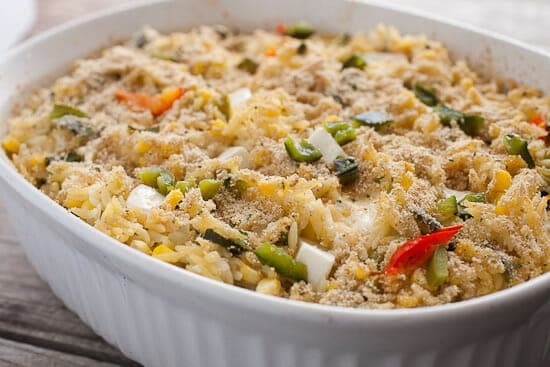 Spicy corn orzo baked with roasted chili peppers and fresh mozzarella. A great way to show off fresh sweet corn this time of year! 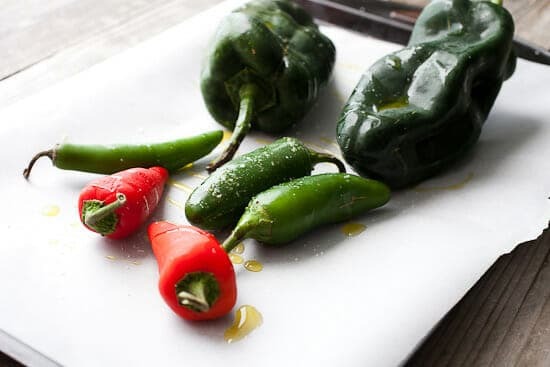 1) Preheat oven to 350 degrees F. Toss poblano and jalapeno peppers with olive oil and season with salt and pepper. Roast peppers for 15 minutes until they are slightly charred and bursting. Let cool while you prep the other ingredients. 2) Cut the kernels off the corn (use a bowl to catch the corn for easier management). Dice onions and garlic as well. 3) In a large skillet over medium heat, melt butter. 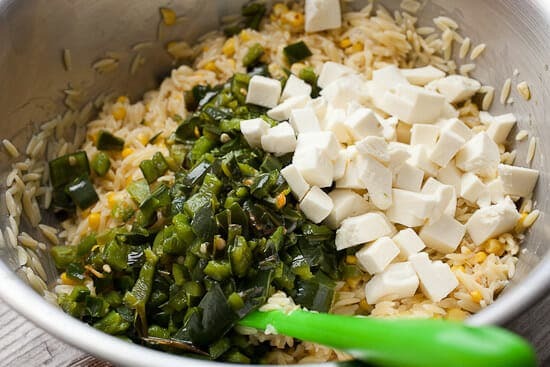 Add onions, garlic, and corn kernels and cook until veggies soften, 3-4 minutes. Then add cream and season with salt and pepper. Cook until the mixture thickens a bit, another minute or two. 4) Cook orzo according to package. 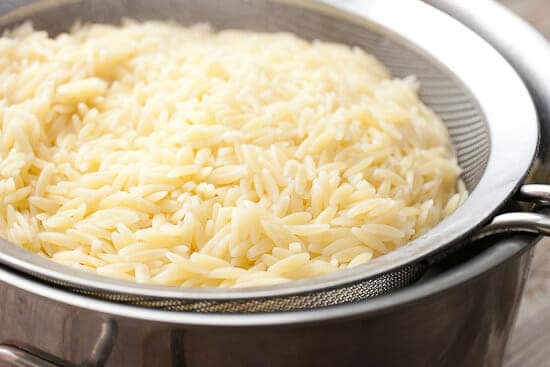 Then drain and rinse orzo to keep it from sticking. 5) When peppers are cool, remove seeds and stems and dice up peppers. You can leave the skins on or take them off. 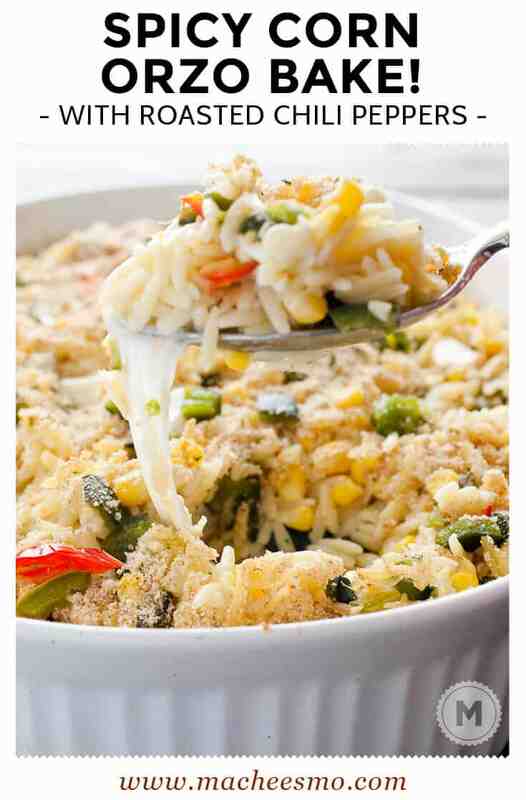 6) In a large bowl, combine orzo, diced peppers, the corn mixture, fresh cubed mozzarella, and parmesan cheese. Stir together well and season with salt and pepper. 7) Transfer orzo mixture to a lightly buttered 2 1/2 qt. baking dish. Top with bread crumbs. 8) Bake the orzo dish for 20 minutes until cheese is melted and top is browned. Let cool a few minutes before serving! I used an almost random mix of peppers for my version of this bake. 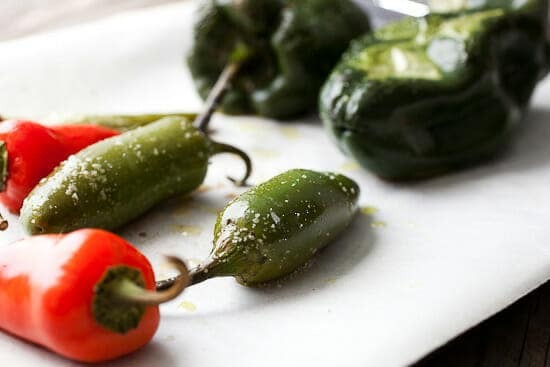 I highly recommend roasting a few poblanos as they are mild and just give a nice pepper flavor to the dish. The red fresnos I threw in on a whim just because I had them in the fridge. You do want some Serrano or jalapeno peppers for some actual heat also though. I would say somewhere between 2-3 peppers is a good start for heat. I just tossed the peppers with some olive oil and a sprinkle of salt and roasted them for about 15 minutes at 350 degrees. They don’t need to be completely blackened. These were my finished roasted peppers, slightly bursting and smellin’ good. 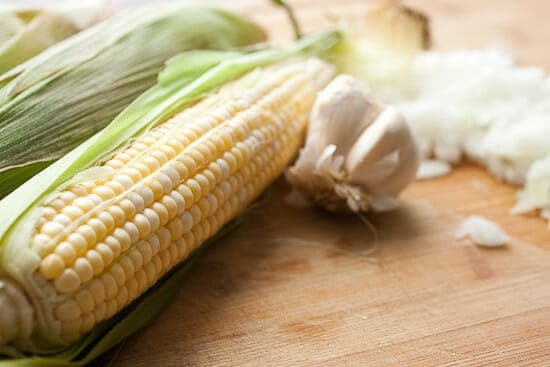 Please try to find some fresh sweet corn for this dish. You could use frozen, but this time of year fresh corn should be cheaper than frozen corn so just go with it! Melt some butter in a large skillet and add the onions, garlic, and corn and then cook those down over medium heat until the veggies start to soften. Then add the cream and season well with salt and pepper. If you thickened this up a bit more and added more dairy, you would have a pretty classic creamed corn. While the peppers are roasting, cook your orzo pasta according to the package. Once it’s cooked, drain it and rinse it with cold water to stop the cooking and make sure it doesn’t stick together in a big chunk of pasta. Stir the orzo together with the corn mixture and fold in the chopped roasted peppers (I removed the seeds, but left the skins on). Add some fresh mozzarella and parmesan also. Transfer all of this to a buttered 2 1/2 qt baking dish (or an 8×8 baking dish). Sprinkle of bread crumbs on top and bake the whole thing for about 15-20 minutes until the cheese is melted and the top is crispy in parts. This looks amazing. Will totally try this one, this next week. Oh my YUM! This looks incredible. Hosting a family party with a taco theme, and will be making this as a side dish for sure! This was great! I wanted it to be a vegetarian main dish, so I added some black beans for protein and filler. Will definitely keep this recipe in rotation. -Add Frank’s Red Hot, and turn it into a buffalo chicken orzo bake! We also take out one jalapeño to account for the amount of hot Frank’s brings. This has become an easy staple. Thanks! 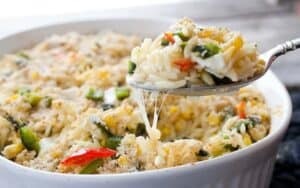 How much frozen corn can I use in this recipe. Hey Jackie, two ears of corn usually works out to about a cup, maybe 1 1/4 cups. You could use up to 1 1/2 cups without a problem! Good luck!